Euthanasia... - Real Cockatoo Facts! "This bird has been in so many homes and the last one kept him in a cockatiel cage - he must weight at least 1200 grams and is just huge. He has plucking problems and tries to bite any man that goes near him, we thought we were rescuing him but hes gotten worse. He has not been out of his cage for months because of the aggressive attitude. We can't take this anymore and want you to come and get him. Maybe the best thing for this poor bird is to just be put to sleep and end his misery"
The bird in question is a 9 - 10 year old U2 - what another sad situation that we are being asked to help with.. I haven't really seen a topic like this discussed and would like to share your thoughts..severe pluckers/mutilators and major behavioral issues - is there ever grounds for euthanasia and who should decide? I know our vet will not euthanize an animal just because the owner says they want it put down, if there is no medical reason for it to be done, they won't do it, being bit or moving away is not grounds enough. 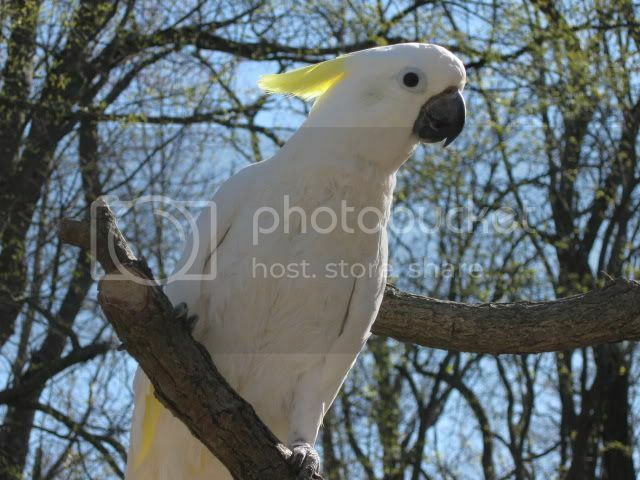 We have undomesticated parrots - cockatoos being by far the most unpredictable species of them all - attacking and seriously hurting people, only to be rehomed - they attack - rehomed again - attacking not only the owners, but also the other animals/birds in the home - rehomed/sold again - and the cycle continues.. In the domesticated side of cats/dogs an overly aggressive dog - such as a pitbull who are know to be unpredictable, can/will/ and are put down at signs of aggression or put into treatment - the life span is nowhere near that of a parrot, so they have a few years of rehabilitation and settle in somewhere and live out their life for another 5 - 10 yrs. Here we have parrots that can take years upon years of rehabilitation just to learn "how" to be a bird and "how" to live with humans - and than spend another 50 plus years hoping that wherever they may end up will know what to do for them if the owner should die/move away or give it up for various reasons..
Is this to controversial of a subject? I've had discussions about this topic with other volunteers at the rescue where I volunteer. Sadly, I truly believe that the time is coming, sooner rather than later, where birds will be euthanized for space, just like dogs and cats are now. And it just breaks my heart. More and more birds keep being bred, but since most people are ill-equipped to live with a bird, they find their way to shelters and rescues. Most rescues I know of are full with waiting lists. Most of the volunteers at the rescue where I volunteer cannot take any more birds in -- we're at our limits. And these are the homes where many of the "hard-to-adopt" birds would go. Add in parrots' long life spans, and it just gets really depressing. My husband and I have six parrots. We are at our limit. Their ages are 8, 15, 5, 22, 12, and 8. We're in our early 30s. There's a good chance that 5 of them (my budgie is 5 and they have shorter lifespans) could be with my husband and me into retirement, which means, unless circumstances change, we won't be adding any new birds to our house. Once we get to the point of euthanizing for space/resource limitations, I think it makes sense that those are the most tortured -- or have the least likelihood of finding some semblance of happiness in a pet home -- should be euthanized before those that are considered adoptable. Basically the same system that's in place now for dogs and cats. It's really tough and sad to think about. Of my 6, at least 3 would have been euthanized under a blanket mutilation/severe aggression policy. Yet, in our house, they've found a kind of happiness. I believe that the vast majority of birds can find a kind of happiness in the right home; the problem is there is a dearth of "the right kind of home" when compared to the birds looking to find one. There definitely are no easy answers. I do not believe any bird should be euthanized because of a behavioural issue. People euthanize because the bird is a problem to them and they can't handle it. May I submit as evidence - Noelle. I don't think so! Have you tried a search for "euthanasia" in this Philosophy Forum? We have beat this subject to death. Euthanasia is a fact of life and as we get more and more parrots, more and more will be euthanized. Parrot Euthanasia - Soon Common? Yes, I agree that it is a very disturbing reality - more and more birds are being euthanised every year because their caretakers are not equipped to deal with their behavior issues. Case in point. Not too long ago, an SOS email came to the sanctuary, which had been mass-mailed to many other rescues within a 3 state radius. The problem? A biting U2 that had been in it's current home for 10 years. The email was sent by it's caretaker mid-week, stating that if she did not find a home for the bird within 2 days, she would euthanize it. And yes, she would euthanize it - she was (of all things) a vet! Luckily for the bird, a rescue organization in Maryland was able to step up to the plate immediately and take the bird in, so his life was spared. Should we euthanize all the unwanted children in the world? Dogs, cats, rabbits, etc.? We are the problem and we should be disgusted with ourselves. I have always believed that as long as any healthy animal is being euthanized, we should stop breeding any animal. We are such an arrogant species. We can't even stop children from being sold. But the battle to stop it has to begin somewhere. And I know there are not enough good bird homes out there and I also know birds ARE being euthanized. I also know behavioural issues can be changed and that is 100 % based on science. What irritates the hell out of me is people really don't want to take the time to learn how to deal with these issues, to change/modify them. Whatever happened to responsibility? I have days where I think how different my life would be without my birds. I could travel, my apartment would be clean all the time, I'd have money, blah, blah, blah but I owe my birds more than that. They have gotten me through the worst times of my life, death of my mother, father, brother, sister, friends, cancer, etc. I am a better person because of them. I feel sorry for the people who will never get to see that. PS: I know, I know, I'm supposed to be cleaning cages. Sorry, I actually didn't do a search - I posted this because of the situation before us and the fact that someone actually said those words to me. Very interesting articles - thank you for the links. Yes, it probably has been beaten to death, just like trying to educate people on purchasing chicks from breeders/petstores, and the words of advice on "not petting your cockatoo" and on and on, everything is being beaten to death as you say, and as the years go by, a new group of bird owners emerges and the questions/concerns start over again, repetition is boring, but at times its necessary to repeat certain things, and as the economy is hitting ALOT of people - its a reality for many. Euthanasia for medical issues is a whole other thing compared to a bird with severe emotional/behavioral issues. We all like to think that "we" are the perfect home for this messed up bird - "we" know exactly what to do - "we" have all the answers and will help them to stop biting/screaming/mutilating - fill in the blanks.. But, the sad realization here is that as the years go by - there are more and more birds and less and less places for them to go - the hundred rescues that were 1/2 empty in 2005 are now overflowing and simply can't take anymore - so those that cannot find suitable homes with the "perfect" human, end up shuffled over and over and over - the behaviors begin as a result - how many years do they have to be shuffled around before they find that "perfect" someone who can actually help them, and what if they never do..
Anna, that's why ABA is so important. What I really don't get is why they (and you know who I mean) need to make it so complicated when it really isn't. We've come a long way in the last 6 years but we sure have a long way to go. The fact is parrots don't make good pets and most of us sure as hell don't make good caregivers for them. As long as there is a dollar to be made, people will never stop breeding them but we can sure as hell try to stop as many people as we can from buying them. I know Anna and it is a harsh reality isn't it...I wish I knew what to answer but you are right...I think in each birds case or each animal careful consideration as to "quality of life" is what comes into the evaluation.Unfortunately it is a human that has to make that call and there is never a guarentee that any bird in anyone's care is going to be "cured,helped,changed or rehabilitated" but it is a nice dream. The only ethical reason for the termination of life in a companion animal is the animal's suffering�not the owners. If a bird has a terminal illness with no ready options, and it is in pain, euthanasia is appropriate. If a bird has a contagious and terminal illness for which there is no cure and/or inoculation, and which may infect an entire flock, euthanasia is arguably a choice. But for plucking, for "screaming," even for aggressive behavior, death for the animal must cease to be an option. I will comment further later if anyone is interested. Oh, hell, even if they aren't. Whoever coined the term "bird brain" was probably projecting. Canada is a little different when it comes to rescues etc. We have one Sanctuary that I know of on the West Coast.At some point there was question to what would happen to all those birds because there was no donations or support for this place to stay running. Yeah there is fundraising but there is not allot of help for places like this in Canada. There are only 2 good running rescues that I know of and one of those two are not able to take in any more birds at this time because their building was sold on them and they are managing on fostering their birds at this time. They are working on fundraisers to raise money for a new building but who knows how long that will take.Meegsmom is filling up quite fast and as there are not many adoptive homes that are able to take in a bird with high needs that leaves her full at this time.There is also the fact that funds are just not there to keep them afloat really either.Yeah there is fundraising but...people are not that generous around Canada when they have a mindset that they have their own homes to worry about and that is the mindset of most people...they also don't realize that the cost of vet care is unreal around here and no where near as advances as the USA.Dianne Dwyer from what I understand has made it known she isn't able to take in more birds either and although if absolutely necessary will take in a special case if it is the very last hope or option but isn't able to readily take on any more. So now what...the resources are just not there to help these rescues function and stay afloat so at some point something has to give but what...If I could I would take in more birds but I don't have the time or space for any more and I can't even try to kid myself into thinking I can. I can outreach with new people to educate them into being a good prospect for adopting and I try to do that. So now you have a bird that is in the worst shape...I am going to use someone like Mango for example that is going to cost a rescue at LEAST $1000.00 (and that will just be to run blood work and dress the wound likely no surgery yet)to get back on track and treated for the mutilation.So he gets the dressing changed once a week at least and then eventually has to go for surgical debribing. That is going to cost approx another $1000.00.His adoption fee is only $600.00. There is no government funding to help pay for this and the vets do what they can to help but can only knock off so much off the bill too.So now he is in the rescue and recovering and MM wakes up to find he has torn off the dressing and has ripped open his chest again and worse. Takes him back in...this can go on for months and months and no changes. I would like to think that Anna,myself,Bev...all of us could change this in our home but it isn't always going to happen. A cockatoo like Noelle gives us much hope that it can but not all birds are Noelle and there isn't always a home like Janet's available for a bird like Mango. So what is best for Mango??? ?Should a person let him go on years and years living in a cone unable to really do allot just to give him a break from the cone and have him rip himself open again.Or would it be best for him to let him have an "easy death". Maybe it isn't the way to look at it and I hate to think of any bird loosing it's life but when a person is facing a situation and decision like this one I think minds need to stay open and look at the bigger picture. Just think of the money that has been spent on one bird and how many lives it could have saved in the process.I am not trying to put a value on one birds life over another either...I will say again...I don't want to see ANY bird die because of things us humans did to them.I really don't but this is just a way to look at everything involved and help understand the questions being faced in this time. I am not saying all mutilating birds should be put down without trying to help them. I am not saying that at all. I am just trying to let you see what a rescue facility has to face and the decisions they make may be judged cruel when really there might not be another option. When you are dealing with aggression...no I don't think euthenasia is the answer. Time and patience and love can go a very long way and so will understanding.Plucking...no I can't imagine because that is superficial and a bird can live 100 years plucking it's feathers out...but each case of a bird mutilating (which can be lifelong in some cases) needs to be looked at independantly and not lumped in to say it can be changed.It may not be changed. It is true that humane society facilities are euthenising weekly many cats and dogs that are very potential companions in the right home but they have really no other choice but to eventually make a decision to put them to rest to make room for others.They can not keep one dog for 5 years waiting for the right home to come along.Unfortunately I believe rescues for birds are getting a harsh reality that this is what it will come to for birds as well. Ok, I'm confused. I re-read Meegsmom's initial post. This wasn't about Anna or her rescue. Did I miss something along the way? The thread was started by Anna when she got an email from someone through her rescue...then it went in different directions after that.She was asking in theory and it was painted with a very broad brush that no bird unless terminally ill should be euthenised.I am just painting another way to look at things that is all. I am just using her rescue for example as well as the others to help understand where a rescue stands and what a rescue here faces and not necessarily talking about an owner of a bird but rather what a rescue faces.I think that is what Anna is asking about anyway.No one is actually saying Mango or any other bird needs to be put to rest here. I was just using them for example is all. Last edited by Janny; 01/16/10 08:20 PM. Lord knows no one person, or organization can save them all - and no one situation is exactly the same. Matt and I have had many talks about how difficult it is when there are so many birds in need. Rescue is a tough, tough job, that's for sure. There are less avian veterinarians, not that people would use them. There are less quality rescues. Harsher environments mean more stress on tropical birds. The number of birds increase. The number of avian vets increase, not that people would use them. The number of legitimate rescues increase. So it boils down to scale because all the rescues are busting at the seams, the few up north and the many down south. The only difference I can see is that birds in cold climates will suffer the most, whether sick or not, because it is an alien environment to them and they cannot spend near enough time in quality light and air. 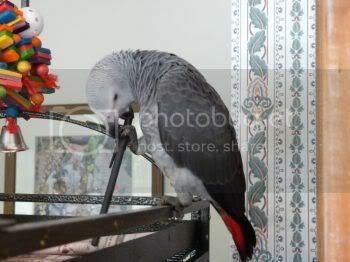 Most vets, and rescues, will now say that parrot euthanasia is here, and here to stay. Absolutely! As a matter of fact, my AV's personal birds are ones that were brought to him to be, needlessly euthanized.